Tryptophan, also known as L-tryptophan, is a type of amino acid used in the biosynthesis of proteins. It is required for normal and healthy growth in infants, while in adults, tryptophan maintains the nitrogen balance. It is an essential amino acid which the human body needs, and it must be supplied externally through tryptophan-rich foods. An important function of tryptophan is that it assists the body to synthesize niacin and serotonin. Niacin, or vitamin B3, is important for overall good health. It improves cholesterol levels in the blood and reduces cardiovascular risks. Serotonin, on the other hand, is a neurotransmitter that stabilizes mood and calms down the mind, inducing a healthy sleep. For a healthy body, our mind should be healthy and in a sound state, for which it requires the appropriate amount of serotonin dosage. 5-HTP tryptophan helps the brain to produce serotonin, or the “happiness hormone.” The serotonin production in our brain is directly linked to the tryptophan level in the body. Depletion in the tryptophan level leads to a serious drop in serotonin production, which, in turn, affects the mood and results in mood disorders including stress, irritability, and anxiety. Serotonin deficiency has been linked to sleep disorders, depression, aggressive behavior, suicidal tendencies, and reduced motivation. Thus, the brain has to produce a good amount of serotonin for a healthy and stress-free mind. And that can only happen when our body is supplied with a healthy dose of tryptophan. You can receive a large amount of tryptophan from the following tryptophan-rich foods. Rich in protein, eggs are healthy and delicious. Eggs, especially egg whites, are rich in tryptophan and tyrosine. These two amino acids highly contribute to the antioxidant properties of eggs. Chicken and turkey are rich in tryptophan. It has been found that a portion of 4 ounces of chicken or turkey breast provides 350 to 390 milligrams of L-tryptophan. Lamb, beef, pork, and game are red meats rich in protein. They provide a considerable amount of proteins like tryptophan, but they also contain a high amount of saturated fats that affect the cholesterol level. Among all seafood, shrimps contain the highest amount of tryptophan, with 330 milligrams for a four-ounce serving. Other seafood like salmon, tuna, sardines, cod, crab, and scallops also provide about 250 to 400 milligrams of tryptophan per serving. 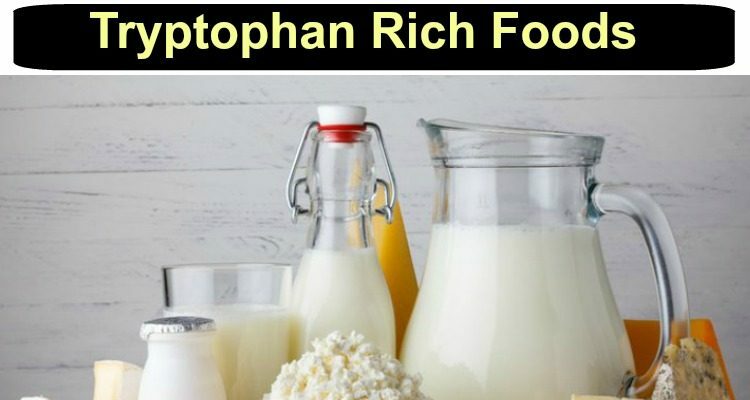 Although not as much as fish and eggs, dairy products like cheese, milk, and yogurt can supply a good amount of tryptophan protein to vegetarians. Soy products like tofu and soybeans are tryptophan-rich vegetarian foods. They are excellent tryptophan sources for vegans and vegetarians. A handful of nuts like cashews, almonds, and pistachios, as well as edible seeds like chia seeds, pumpkin seeds, flaxseeds, sesame seeds, and sunflower seeds can improve your serotonin level, as they are high in tryptophan. Belonging to the legume family, kidney beans, black beans, peanuts, and lentils are tryptophan-rich. Include at least ¼ cup of legumes in your daily diet for better health. For a healthier and happier mind, include the above-mentioned tryptophan-rich foods in your daily diet. Do Bananas Also Have Tryptophan? The answer is, yes! Bananas do contain tryptophan. Daily consumption of bananas can greatly elevate the mood as they regulate the release of the chemical, serotonin, by supplying tryptophan to the body. Bananas are considered a superfood as they contain high amounts of essential nutrients. According to the USDA National Nutrient Database for Standard Reference, a standard-sized banana contains 105 calories, 0.39 grams fat, and 0.011 grams of tryptophan. In addition to that, bananas contain nutrients like riboflavin ( 0.086 grams), iron (0.31 grams), and vitamin B6 (0.433 grams), all of which are required to convert tryptophan into niacin. Thus, we can conclude that mood-enhancing and stress relieving are among the other important health benefits of bananas. They are amazing sources of tryptophan and should be eaten daily to keep our moods stable and content. In fact, since bananas are mildly sedative in nature, they are excellent tryptophan foods for sleep. In addition to these tryptophan-rich foods, there are tryptophan supplements available. However, it is recommended to consult your doctor before taking any of these supplements, as they could have certain side effects, and may not be allowed in certain conditions such as pregnancy.